THE KETEA (Cetea) were the monsters of the sea, the two greatest of which were the Ketos (Cetus) slain by Perseus in Aithiopia (Ethiopia) and the Ketos slain by Herakles at Troy. Ketea were usually depicted as serpentine fish with long rows of sharp teeth. Nereides often appear riding side-saddle on the backs of these creatures. Ketos was also a generic word for any large sea-creature and included mundane whales and sharks. KETOS AITHIOPIOS (Ethiopian Cetus) A Sea-Monster sent by Poseidon to ravage Aithiopia (Ethiopia). Andromeda was chained to the rocks as a sacrifice to the beast but she was rescued by Perseus when he slew it. 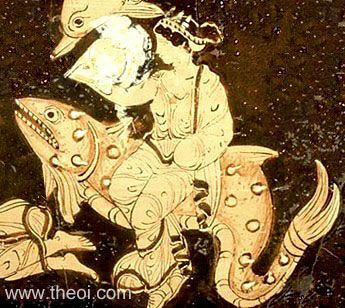 KETOS TROIAS (Trojan Cetus) A Sea-Monster sent by Poseidon to terrorise Troy. It was slain by Herakles. "[Poseidon] climbed up into his chariot and drove it across the waves. And about him the Ketea (Cetea, Sea-Monsters) came up from their deep places and played in his path, and acknowledged their master, an the sea stood apart before him, rejoicing." "[Odysseus cast adrift at sea :] ‘I fear that . . . some god may send out against me, from the brine, a Ketos (Cetus, Sea-Monster), one of the swarming strange huge creatures in the breeding grounds of Amphitrite.’"
"Many are the horrors, dread and appalling, bred of earth, and the arms of the deep teem with hateful monsters (knôdala antaioi)." 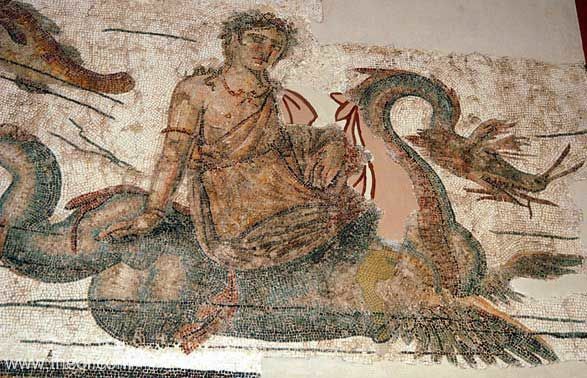 "She [Thetis] sits in barren crypts of brine: she dwells glorying mid dumb Ketea (Cetea, Sea-Monsters) and mid fish." "[The Nereides arrive for the funeral of Akhilleus (Achilles) :] As rushed their troop [the Nereides] up silver paths of sea, the flood disported round them as they came . . . Moaned the Ketea (Cetea, Monsters of the Deep) plaintively round that train of mourners." "Into the great deep Thetis plunged, and all the Nereides with her. Round them swam Ketea (Cetea, Sea-monsters) many, children of the brine"
"[When the Sea-Serpent spawn of Typhon emerged from their underwater cave :] Shuddered the very Ketea Pontos (Cetea, Monsters of the Deep)." "When the Teukrians (Teucrians) mitted neglectfully to make sacrifices to Poseidon at the due season, the god became angry and destroyed the crops of the goddess [i.e. the grain of Demeter]. And he set on them a prodigious Ketos (Cetus, Sea-Monster) that came out of the sea. Unable to endure the Ketos and the famine, the Teukrians sent a message to Hierax begging him to save from the famine. He sent them barley as well as wheat and other foods." "[From a description of an ancient Greek painting at Neapolis (Naples) :] Poseidon's journey over the sea I think you have come upon in Homer, when he sets forth from Aigai (Aegae) to join the Akhaians (Achaeans), and the sea is calm, escorting him with its sea horses and its Ketea (Cetea, Sea-Monsters); for in Homer they follow Poseidon and fawn upon him as they do here in the painting." "[From a description of an ancient Greek painting :] The pirate ship sails with warlike mien; for it is equipped with prow-beams and beak, and on board are grappling-irons and spears and poles armed with scythes. And, in order that it may strike terror into those they meet and may look to them like some sort of monster [i.e. a ketos], it is painted with bright colours, and it seems to see with grim eyes set into its prow, and the stern curves up in a thin crescent like the end of a fish's tail." "The Ketea (Cetea, Sea-Monsters) mighty of limb and huge, the wonders of the sea, heavy with strength invincible, a terror for the eyes to behold and ever armed with deadly rage--many of these thee be that roam the spacious seas, where are the unmapped prospects of Poseidon, but few of them come night the shore, those only whose weight the beaches can bear and whom the salt water does not fail. [The writer lists various mostly unidentifiable species of sharks, whales, and seals :] Among these are the terrible Lion and the truculent Hammer-head and the deadly Leopard and the dashing Physalos (sperm-whale); amomg them also is the impetuous black race of the Tunny and the deadly Saw-fish and the dread gave of the woeful Lamna and the Maltha, named not from soft feebleness, and the terrible Ramas and the awful weight of the Hyaena, and the ravenous and shameless Dog-fish. Of the Dog-fish there are three races; one fierce race in the deep seas is numbered among the terrible Ketea (Cetea, Sea-Monsters); two other races among the mightiest fishes dwell in the deep mud." "The huge Ketea (Cetea, Sea-Monsters) that are bred in the habitations of Poseidon are, I declare, no whit meaner than the ravening children of the land, but both in strength and size the dauntless terrors of the sea excel . . . The Ketea that are nurtured in the midst of the seas are very many in number and of exceeding size. And not often do they come up out of the brine, but by reason of their heaviness they keep the bottom of the sea below. And they rave for food with unceasing frenzy, being always anhungered and never abating the gluttony of their terrible maw : for what food shall be sufficient to fill the void of their belly or enough to satisfy and give a respite to their insatiable jaws? Moreover, they themselves also destroy one another, the mightier in valour slaying the weaker, and one for the other is food and feast. Often too they bring terror to ships when they meet them in the Iberian Sea in the West, where chiefly, leaving the infinite waters of the neighbouring Okeanos (Ocean), they roll upon their way, like unto ships of twenty oars. Often also they stray and come night the beach where the water is deep inshore; and there one may attack them . . . [Oppian goes on to describe whale-hunting]." "There are also those among the stern Ketea (Cetea, Sea-Monsters) which leave the salt water and come forth upon the life-giving soil of the dry land. For a long space do Eels consort with the shores and the fields beside the sea; so too the shielded Turtle and the woeful, lamentable Castorids (Beavers), which utter on the shores their grievous voice of evil omen. He who receives in his ears their voice of sorrow, shall soon be not far from death, but that dread sound prophesies for him doom and death. Nay, even the shameless Whale, they say, leaves the sea for the dry land and basks in the sun. And Seals in the night-time always leave the sea, and often in the day-time they abide at their ease on the rocks and on the sands and take their sleep outside the sea." "Come now, savage monsters of the deep (ponti monstra) [Ketea (Cetea)], now, vast sea, and whatever Proteus has hidden away in the furthest hollow of his waters, and hurry me off, me who felt triumph in crime so great, to your deep pools." "[In the train of Poseidon] the winds and tempest are silent and with tranquil song proceed the Tritones who bear his armour and the rock-like Cete (Cetea, Sea-Monsters) and the Tyrrhenian herds [seals], and gambol around and blow him, saluting their king." "Ketos (Cetus, Sea-monster, huge fish, whale) : A marine beast with many forms. ‘For it is a lion, a shark, a pard, a puffer-fish,] a saw-fish which is called malle, which is hard to struggle against; and a ram, an animal hateful to see.’"
Caeretan Black Figure Vase Painting C6th B.C. Corinthian Bilingual Vase Painting C6th B.C. Greco-Roman Boscotrecase Fresco C1st A.D.
Greco-Roman Carthage Floor Mosaic C3rd A.D.
Aeschylus, Libation Bearers - Greek Tragedy C5th B.C.